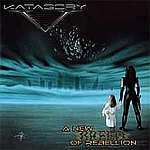 Review: "Katagory V: A New Breed of Rebellion" - Sea of Tranquility - The Web Destination for Progressive Music! A New Breed of Rebellion is the latest release from Utah based power/progressive metal band Katagory V. They have a sound that incorporates elements of Fates Warning, Queensryche and Judas Priest. Vocalist Lynn Allers sounds remarkably like Ray Alder while the band's twin lead guitars courtesy of Curtis Morrell and Trevor Asire call to mind classic albums like Empire and Awaken the Guardian. Do not be fooled by the portentous fanfare of the sci-fi flavored keyboards that open the album! Katagory V use keyboards so sparingly that they are all but unnoticeable. Likewise, despite the futuristic doom portrayed in the artwork adorning the CD booklet, the songs are refreshingly humanistic and dwell on the darker side of life. "Sands of Time" sets the tone of the CD with lyrics that lament the uncertain future of the human race. Maybe that artwork isn't so inappropriate after all. "Turn to Grey" is an excellent progressive metal rocker, chock full of jerky rhythms and unexpected time changes. "A New Breed of Rebellion" features some nice dynamics with an extended acoustic introduction that segues into a Savatage style power ballad. "One Last Time" similarly ends the album on a surprisingly pretty and mellow note and I was very much reminded of the Judas Priest classic "Beyond the Realms of Death". Katagory V are equally adept at short and fast burners like "No Response" and "Chrono-logic". One can happily bang his or her head to the frequent key changes. My only qualm with the album is the production, which is dull and lifeless. The abysmal recording tends to seriously undermine the power of compositions like "Your Dreams" and "One Last Time". This is unfortunate as the band write some very good songs. As A New Breed of Rebellion is only the band's second recording, I have high hopes for their next release. A proper producer could elevate Katagory V into the stratosphere. I've had the album since it came out around Feburary, and it's definatly their best yet! I'm not sure if the production is really that bad, maybe a little thin compared to many of the bands in this genre that probably get a bigger budget, but as a whole, a really great sounding album with a lot of variety in the song writting and excellent talent. Their live performance in Atlanta in 2003 was what peaked my interest and they didn't let down when I finally bought this. I agree, if they do boost up the production on the next one, or a larger lable like Insideout or Nuclear Blast takes them, they'll be a highly competative band that will be very hard to ignore. Becasue as it stands, they've got what's been missing in progessive metal for a long time!